Is your party larger than 6? Prefer to make your reservation via phone? Call (309) 282-7777 and speak with our hosts to make your reservation. Enjoy a unique dining experience in one of our private banquet rooms. Our private rooms offer an old world charm, surrounding you with natural, exposed brick. Seating is customizable to your needs, personal table decorations are welcome, and HD - A/V is available. Featuring a brilliant mural of Peoria classics by the late Vin Long, a local artists and personal friend of Two25, the Private Dining Room will accomodate up to 60 guests seated, or 100 guest coctail style. The massive oak double doors allow for full privacy during your special event. 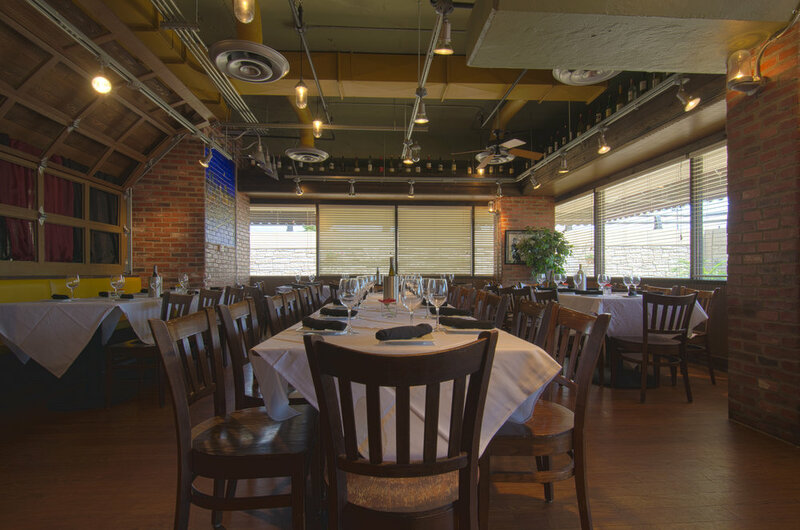 The large windows on two sides of the Sun Room allow for a lovely view of our outdoor patio, the room can accommodates 45 seated guests or 60 guests cocktail style. Expand your event with direct access from the room to our Patio for a memorable indoor/outdoor experience. Interested in off site catering? Anything from bagged lunches for the office, to a full service, plated meal; Two25 has a great selection to offer. Executive Chef Carlos Rojas can also provide a fully customized menu to fit your needs. Call us today to discuss your catering needs.